Meet Ruggles, he’s the adorable little rescue puppy in the video below. His favorite thing to do is play and romp around with his human friends. 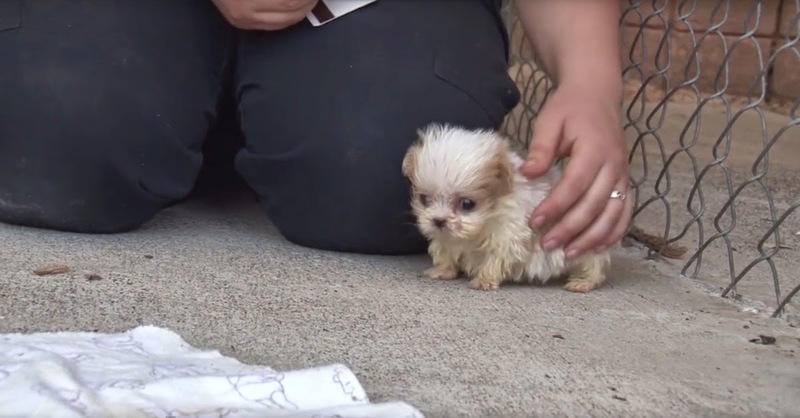 But this adorable little puppy angel has already had a pretty tough life, the poor little Shih-Tzu was born and raised in a horrible puppy mill. The conditions at this particular dog factory were so terrible that a police bust was called in and little Ruggles was finally freed from the horrific environment. It’s a shame that Ruggles had to go through such a terrible start to his tiny little life, but thankfully he was saved by some good humans! Ruggles’ story just goes to show you that we should always be kind to our wonderful furry friends. Though it took some time and patience for the sweet little guy to gain his health and confidence back, the video below will show you that he is happy once again. Luckily, he made a best friend who helped him along the way. All animals deserve a “forever home,” and the two adorable animals in this sweet clip are no exception! Make sure to spread the word that puppy mills are harmful to all of our dog friends! Please SHARE this adorable video of friendship with your own friends and family!